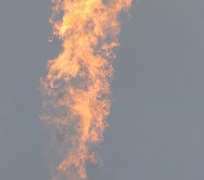 The Federal Government in Nigeria has said that any attempt at stopping gas flaring through legislation now will lead to very unpleasant circumstances, which the nation can hardly cope with. Such action, it said, would lead to the loss of billions of dollars derivable from carbon credit. Minister of State for Petroleum, Odein Ajumogobia (SAN), disclosed this at the weekend in Abuja while fielding questions from some State House correspondents. He said 80 per cent of the nation's current revenue comes from the production and export of crude oil and as a result, legislating against gas flares would mean the loss of huge revenue from the carbon flare penalties. In an apparent reference to the December 2010 deadline set by the National Assembly to halt gas flaring by oil companies operating in the country, the minister stated that the best approach at dealing with the problem is to work out systematic framework to ensure that gas would be used to power electricity generation and other forms of industrial uses. Ajumogobia said the Federal Government had in the past opposed legislation against gas flares because such actions could lead to the shutting down of crude oil production and ultimately loss of revenue to the country. After several threats to shut down oil fields that flare gas, the government might have realised that this could collapse the country's crude oil production. The minister regretted that gas flaring had continued in the country because of the limited use of the gas being flared. “For one, you can't legislate flares out other than shutting down production. If you legislate it as a law abiding citizen, I will have to direct DPR on the date the law takes effect to direct these people to shut in their wells so that there will be no more flaring but there is no fundamental reason if you legislate an activity for which you can get carbon credit otherwise you deny yourself the carbon credit. “So if flare out becomes a legal obligation, you can't get any benefit from the carbon credit scheme. So we will be losing billions of dollars potentially in carbon credit that we can derive,” Ajumogobia said. According to him, one of the short-term measures embarked upon by his Ministry to address the problem was to direct the shutting in of the oil fields where the gas being produced and flared was considerably more than the crude oil produced. Through this means, he said, the nation has been able to reduce gas flares from 2.5 billion cubic metres to current 1.5 billion cubic metres. As a long-term measure Ajumogobia disclosed that his Ministry was currently working hard through the gas master plan to ensure that by the end of the first term of the current administration gas flaring would have been a thing of the past. Speaking on the planned probe of the downstream sector of the economy to unearth the huge resources spent on petroleum subsidies over the years, he said he was positive not much would come out of from the planned probe. “I personally felt it is going to be a futile exercise because people are dealing with documentation. When you bring in oil and it has been consumed what you have is paper work and if the paper works look right it is going to be difficult. I don't expect the audit to disclose that this is the situation. If you tell me to go and bring petrol and I bring, just take a number say N5 billion and distribute it and you haven't paid me and you tell me to go and bring more, I think a normal person that is making normal profit would say what about my N5 billion before we start talking about a new one. “But if I go and bring some more then there is something odd to it to a point that I keep on doing it to a point you accumulate N30-40 billion and then I come to you and say I can't pay this 40 billion and you say okay pay me 25 billion. I mean it suggests that something is wrong but when you look at the paper work, it is calculated, the exchange rate, volume, fright rate. Everybody would give the highest exchange rate even if it happens under a different excha-nge regime. that is why they can give a discount because they know how much they bought it. So when they use the highest, that highest exchange cost can represent N5 billion given the volume when we argue and argue they say we can give you N5 billion discount,” he said. Nigeria was among over 160 nations that met in Kyoto, Japan, from December 1 to 11, 1997, to negotiate binding limitations on emission of gases, pursuant to the objectives of the United Nations Framework Convention on Climate Change of 1992. The outcome of the meeting was the Kyoto Protocol, which came into force in February 2005, and in which the countries agreed to reduce emissions from 1990 levels by six per cent during the period of 2008 to 2012. Consequently, the Federal Government gave 2008 as the deadline for all the oil companies in the country to build gas-gathering projects to stop gas flaring. However, the companies could not meet the deadline as they argued that the Niger Delta crisis and inadequate funding could not allow them build gas-gathering projects in the oil-rich region. The oil companies have insisted on 2012 as the new deadline to eliminate gas flare from old oil fields, and pledged to put measures in place to ensure that no gas is flared in upcoming fields. Following the failure of the operators to stop gas flares in the old oil fields, the government recently increased gas flare penalty from N10 for every 1,000 standard cubic of gas flared to $3.50 per 1,000scf. After several threats to shut down oil fields that flare gas, Acting Director of Petroleum Resources (DPR), Mr. Billy Agha, said recently that the Federal Government had not given a new deadline but was trying to look at all the fundamentals that would enable the operators to flare down or flare out.